One of the most overlooked areas of solder paste printing is the issue of paste maintenance. Regardless of whether the application is large or ultra fine pitch, proper paste preparation and maintenance is the key to good printing. In order to have the proper viscosity and complete blending of the flux and paste it is suggested that something more than a humans subjective view is needed. SMT has gathered a number of paste enhancement machines to help you and your operation achieve the finest possible results, every time, with repeatable and programmable equipment. 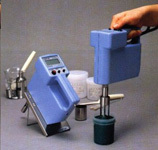 Whether you are mixing, confirming viscosity, testing wetting, tackiness or measuring deposition volume SURFACE MOUNT TECHNIQUES has the device you need for production or QA applications. 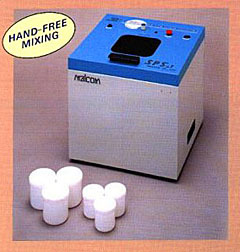 Unlike hand mixing, the SPS Solder Paste Mixer is a non contaminating mixer which utilizes pseudo planetary motion to stir the solder paste. The SPS-1 provides uniform paste consistency regardless of operator skill. The paste temperature rises due to friction, enabling control over the solder paste viscosity. Now a solder paste can be pulled from the refrigerator and ready on the stencil, in less than 15 minutes! The SPS employs a pseudo-planetary motion whereas the solder paste container rotates slowly at the end of an arm which spins rapidly. 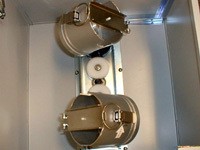 The resulting centrifuge force causes the solder paste within the container to repeatedly fold over itself, thereby mixing and softening itself. When speaking of solder paste, one parameter that is often discussed is viscosity. Viscosity is important as a paste that is too thick (high viscosity) may lead to a bad print in the form of an insufficient filet. A paste that is too thin (low viscosity) may lead to the filet slumping. In order to test that a paste has the proper thickness for optimal printing, the paste's viscosity should be checked with an accurate and repeatable viscometer. It is important to bear in mind that there are basically two components to solder paste viscosity measurement. They are the static viscosity and dynamic viscosity. Static viscosity is the viscosity of the solder paste as it is dispensed off of a tube or syringe onto a screen printer. The dynamic viscosity, on the other hand gives the variation in the thixotropic behavior of the solder paste during the course of the screen printing process. 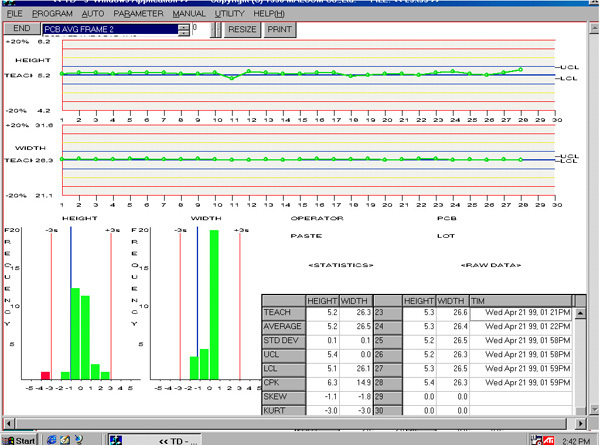 It is important to know the dynamic viscosity of a paste ii order to predict it's printing characteristics. Dynamic viscosity is gained by adding shear to solder paste. 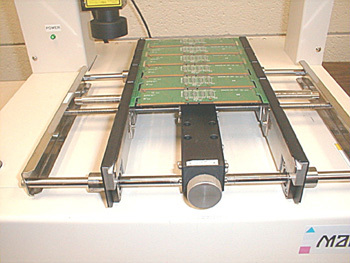 Shear is what the solder paste encounters on a screen printer. By understanding how shear affects solder paste viscosity is critical as its understanding may help to limit printing problems. 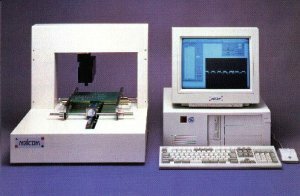 The PM-2, PC-1TL, and PCU-200: Spiral Viscometers by design are able to measure not only the static viscosity of solder paste at low rpm, but it can more importantly measure the dynamic viscosity. This is due to the fact that a true shear force is applied onto the solder paste, simulating the forces that act on the paste on a screen printer. By varying the rpm, one can find the shear sensitivity and thixotropic index of the solder paste, something that could not accurately be done with most other viscometers. 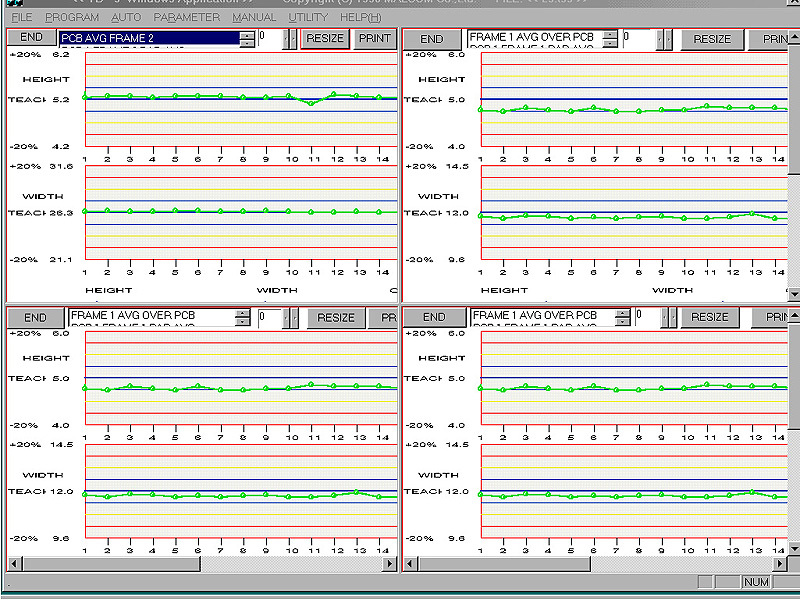 Thus with a viscometer, the user can not only measure batch to batch variation, but can also predict how the solder paste will perform on the screen printer. 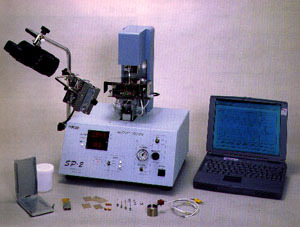 The SP-2 Wetting Tester helps to test the wettability of solder paste and components while actually simulating the SMT mounting and reflow process. The SP-2 simulates the actual temperature that solder paste undergoes during preheat and reflow, letting you easily identify any deficiencies in flux activity or components wettability. Measurement of the solder paste wettability, components wettability, printed board wettability, wettability on temperature rise, and wettability on preheating time. 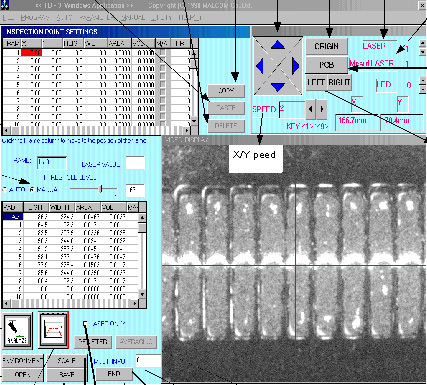 By actual simulation of the SMT mounting and reflow process with standard variable, it is possible to develop an accurate, repeatable evaluation method to determine a solder paste's solderability. In recent years, there has been a rapid miniaturization of electronic devices and components as well as an increase in the use of fine-pitch components. Soldering technology must now accommodate surface-mount devise leads spaced closer together-0.25 mm today vs. 0.50 mm previously. As a result, there is a greater potential for problems such as misregistration, smearing, clogging, and bridging. It is therefore vital that anyone who utilizes solder paste-printing technology be able to measure paste-print height, width, and volume. This is important in determining whether or not the quality of their printing meets their required standards. The TD-3 uses a slit-laser to accomplish these tasks in a non-contact manner. For automatic past-print height and width evaluation, the user selects a fiducial mark (up to 4 per board) as a point of origin, then teaches the system the points to be measured (up to 100 points). 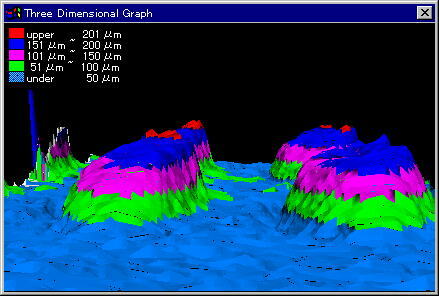 Default user defined measurement parameters may be used. 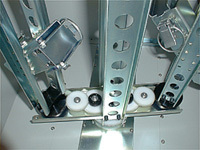 After measuring the past-print height and width, the TD-3 indicated whether the printing meets the specified standards. 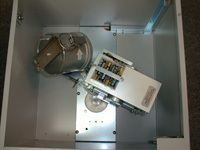 The settings may be saved and used for future inspections. Inspection results can be saved as well.